This Hidden Café In Sultanpur Reminds Us Of Pop Tate's From Archies! Tucked away in Sultanpur, we found a hidden gem, Quotes Café! With a pleasant ambiance and quirky interiors, this café is absolutely adorable! Their menu is loaded with a variety of sinful, thick shakes, ice cream sodas and sundaes. 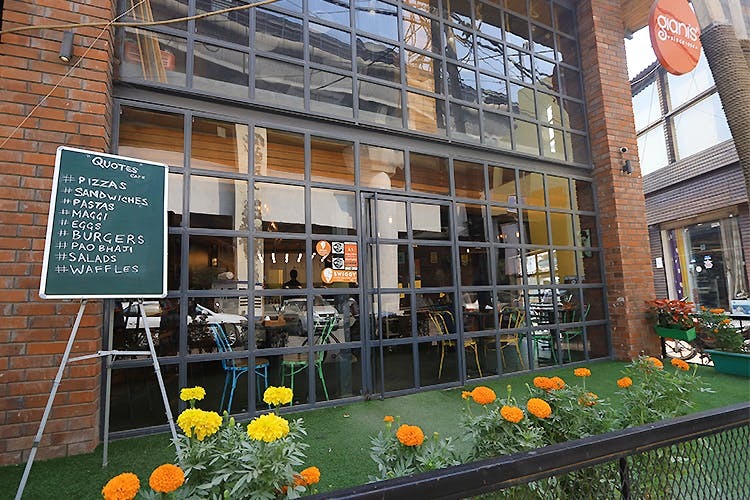 This is a great breakfast place, and being a stone’s throw away from Sultanpur metro station, it’s perfect for grabbing a quick plate of waffles or eggs made to order for all you bustling commuters. This cosy café is perfect for a romantic date or to unwind with some delicious food with your friends over a game of jenga or ludo. We suggest you try out their butter chicken burger, murgh malai tikka and Vilayti Sabz. They also have an interesting selection of Maggi, from Maggi Bhel to creamy mushroom and chicken Maggi. For all of you visiting Sultanpur’s popular home décor stores, stop by Quotes Café to take a break from all that bargain hunting, it’s definitely a saviour in this area. If you’re looking for a pocket friendly, cute café which has some heavenly ice cream shakes, Quotes Café near Sultanpur metro station is ideal for the Jughead in you!